After watching Neil deGrasse Tyson hosting “The Clean Room” episode of the Cosmos reboot last Sunday, I decided to look up Clair Cameron Patterson some more on the web. I couldn’t find any videos of him (I guess he really did avoid the limelight) but there are some very interesting stuff on Google Newspaper Search (which, contrary to what many think, still is being hosted by Google). 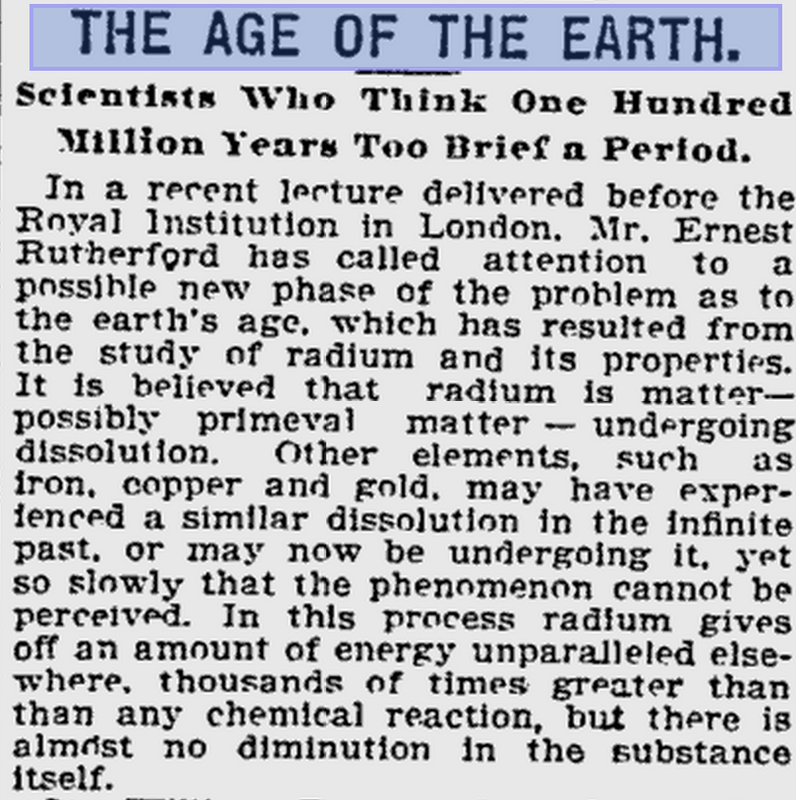 I searched for old articles mentioning “Age of the Earth” (which was discovered in 1956 by Patterson to be about 4.55 billion years). 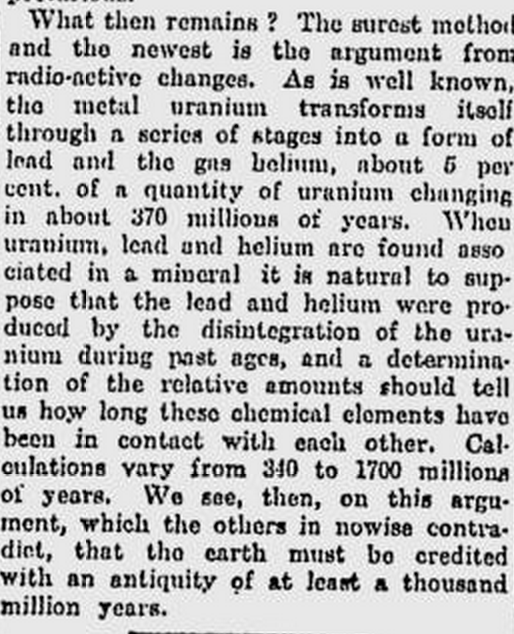 First thing I found was a 1925 article which mentions that radiometric dating with uranium and lead would be the most accurate way to measure the Earth’s age. Interesting that it took almost 50 years to actually find out (from the discovery of radiometric dating in 1907 to Clair Patterson’s finding in 1956). Going back prior to the discovery of radiometric dating, I found multiple articles with widely different predictions. Check out this 1895 article from “The Free Lance” newspaper discussing Geologist James Geikie‘s view on Lord Kevlin‘s Earth age estimations. 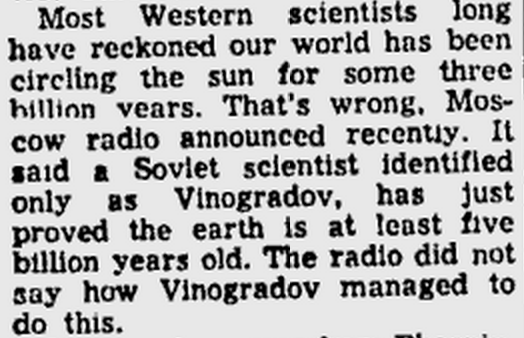 Going back to just before Clair Patterson’s discovery, I found a 1953 article with a little bit of Cold War drama. It’s a real shame that Google News Archive publicly closed in 2011. Thankfully the site still is still hosting articles, but the nice timeline features and user interface have gone away. Google News Archive used to allow you to see a histogram of mentions of specific keywords in historical newspapers. Old newspapers give a unique perspective in history. They offer a compelling way to re-live and re-tell stories and discoveries of the past. There are millions of articles waiting to be digitized and searchable. I hope that we’ll see Google (or some other company) provide enhanced access to that information.